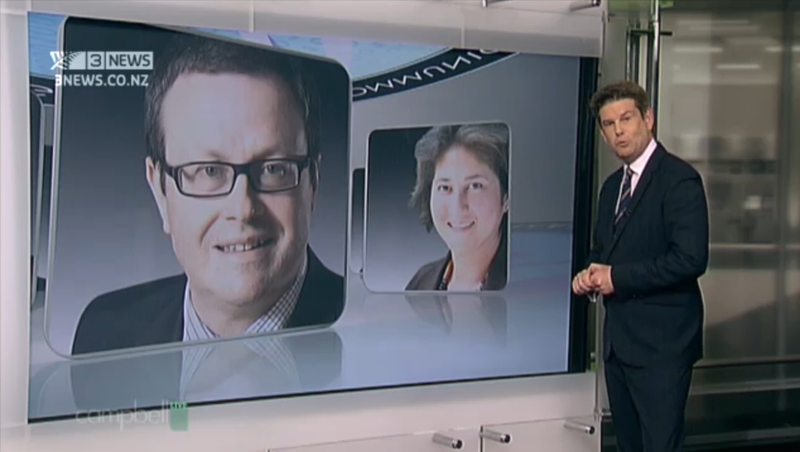 Bowalley Road: Not Proven: "Campbell Live" Still Searching For CONCLUSIVE Evidence Against Key, Fletcher And The GCSB. Something To Put Us In The Mood For The Budget. Not Proven: "Campbell Live" Still Searching For CONCLUSIVE Evidence Against Key, Fletcher And The GCSB. Lots Of Smoke But No Gun: Short of their very own Edward Snowden stepping forward with video, audio and written evidence of every word spoken by the main protagonists in the Kim Dotcom surveillance decision/s, Campbell Live’s investigation can progress no further. WHILE IT IS ENTIRELY FITTING that we should congratulate TV3 and Campbell Live for the show they broadcast last evening, it is important to also acknowledge that they have gone about as far as they can go. John Campbell and his colleagues are now in the same position as the makers of the 1990 TVNZ documentary, For The Public Good, and they face the same hard choices. The evidence they have assembled is indisputably very suggestive, but it is not even remotely conclusive. Back in 1990, the makers of For The Public Good went ahead and drew conclusions anyway – and it cost TVNZ a great deal of money and most of them their jobs. To avoid a similar fate, Campbell and his boss, TV3’s Head of News and Current Affairs, Mark Jennings, had no option but to do exactly what they did last night – end their investigation into John Key, Ian Fletcher and the GCSB inconclusively. Short of their very own Edward Snowden stepping forward with video, audio and written evidence of every word spoken by the main protagonists, Campbell Live’s investigation can progress no further. Yes, there are many questions that cry out for answers, but those in a position to do so cannot be compelled to testify. And if TV3 attempts to put their “best guess” answers in the mouths of the “Intelligence Community” they will be sued – and they will lose. That’s why so few in the mainstream news media are prepared to take on these sort of stories. Every aspect of “National Security” stories is so wrapped in secrecy, and that secrecy is so powerfully protected by the Law, that making any kind of headway is extremely difficult. Nicky Hager or Jon Stephenson, remarkably talented and tenacious free-lance investigative journalists, might beg, borrow and steal the resources and time to track down and marshal conclusive evidence, but TVNZ and TV3 – networks with many competing claims on their time and resources – are required to consider the commercial, legal, and, especially on stories like this one, the political cost of proceeding. It is a huge tribute to TV3’s journalistic values that it was willing to let Campbell run with a story like this for so long. Having led us this far, and having painstakingly constructed the time-lines so essential to the process, Campbell Live is leaving the business of speculation to us. This essay was originally posted on The Daily Blog of Wednesday, 21 May 2014. The only thing Campbell has achieved is confirming that I was stupid for tuning back in after switching off from his last GCSB crusade. Is there not a producer who looks at this and said hey John you are going to burn off a big audience again and make yourself look pretty stupid, not only that 7 Sharp seem to have got their act together and there is that brilliant Jon Stewart Daily Show...but what the hell let's show it anyway as I am looking forward to Paul Henry replacing you as it will be much more fun. well goodness me, all that cool graphic expensive gear, big costly exercise job going nowhere tV3, and John Campbell calendars with dates on, and guess what . Yes we do have an intelligence service. And jeepers what you know they do talk to each other for the security of our own people. And can you believe this they don't want extremists knowing what they have, isn't that awful. The previous idiotic comments from 'David' about "fun" with regards investigative journalism goes to show just how bad the dumbing down of the electorate is and what a game show it all has become. I'm sorry Chris but all Campbell live proved was that John Campbell is a B grade journalist who still has a wounded ego from the JK snapper interview. That government employees had meetings & that the American's top spook sometimes meets govt representatives from 5 eyes partners is hardly a big surprise. The GCSB spying on Kim Dotcom isn't illegal despite Campbell misleading the viewing public by saying so (another example of how Campbell skews facts to cook stories which suit his political agenda). "Still searching for conclusive evidence" mmm if the story had been about Key's cronyism in hiring one of his mates instead of their having had breakfast & can't remember, or had talked about the US 'pivot towards Asia' then it might have been informative, instead it put in some suggestive menacing mood music to cover over a lack of facts (any question with such background music sounds like it has sinister connotations). No Chris after painfully enduring that show the only conclusion I can draw is that Campbell is a small fish in a shallow talent pool who fails to understand the changing geopolitical structure of the Asia Pacific region. The real big picture question is China's challenge to US dominance in the region & how this will impact NZ's future. That all Campbell can offer the NZ public is mood music shows what a small time bumpkin journo he is! Campbell revealed a number of things that deserve some answers, it wasn't just lots of smoke there are real burning issues here. Why has there been a shift from military leadership to leadership with a commercial background? It is clear that threats being given priority now are not terrorist acts or a military attack, it is all about trade and profit. The question should now be asked "Why is the GCSB no longer being led by someone with a military background?" What are we mainly collecting information on now and what are the perceived military threats? Why also would Key feel he had to lie about his relationship with Fletcher, his meetings with him and the manner of his appointment? These were blatant lies and not mere smoke. We now appear to just accept lying from the Prime Minister, it is almost as though he has trained us not to be concerned, ever since lied about his TransRail shares. We have had so many moments over the years where the Prime Minister has downplayed serious pieces of mismanagement and experienced worrying memory loss at convenient times that would have brought down most other leaders, and yet we allow him to get away with it time and time again. Too right, we are being left to to some speculation, but there are strong foundations to base it on and the ball should be in John Key's court. He cannot be let away with dismissive answers any longer. Metiria Turei tried to hold him to account for the appalling neglect of children with beneficiary parents in the latest budget. If there was a genuine reason for excluding beneficiaries then Key should be able to explain it. He did everything thing he could to avoid answering and any explanation that he did grudgingly produce was painfully inadequate. And he got away with it again! "Yes, there are many questions that cry out for answers, but those in a position to do so cannot be compelled to testify." Why ever not?! "The evidence they have assembled is indisputably very suggestive, but it is not even remotely conclusive." Rubbish, the GCSB now has a commercial focus not a military one! John Key lied on several occasions about his relationship with Fletcher and his appointment! Key is not prepared to question the US about how the data we collect for them is being used! Isn't this enough? Campbell Live exposed some burning issues that deserve answers. The Prime Minister can no longer avoid the questions asked by brushing them aside as mere conspiracy theories. He has been exposed for lying to the New Zealand people and he needs to explain why Fletcher was brought into the role and why his particular skills were needed. Journalists shouldn't have to ferret out the truth and navigate through blocked OIA requests to get answers. John Key is our Prime Minister doing work on our behalf, New Zealanders should be able to be reassured that our country is meeting our obligations regarding international law and respecting human rights. If the GCSB has shifted its attention to commercial espionage then we should know and the Prime Minister should tell us. If he refuses to do so then he has no credibility as a leader, he lacks integrity or or any appearance of possessing any moral compass. If he refuses to satisfactorily answer the burning questions then he doesn't deserve our vote! Because, bsprout, journalism is about marshalling facts not opinions. The Government makes no secret of the GCSB's shift of emphasis away from military signals intelligence and towards cyber-security - just visit the GCSB's website. The venue for meetings of the top "Five-Eyes" intelligence personnel rotates among the UKUSA Agreement's membership states. James Clapper was in NZ because it was our turn to act as host - just as it was in 2001, when another gathering of high-powered intelligence delegations swapped notes at the Millbrook Estate outside Queenstown. All of this stuff is on the record bsprout. You just gotta keep up with the play! The actual truth is that quite a few of the top US military and intelligence officials have flown into NZ over the last three years to express disapproval and disbelief at the NZ Government's drift into the Chinese orbit and its unbelievable desire to leave the advanced West. Three or four years ago with China and Russia were appeared to offer us some slack. Allow us to pretend the GCSB was mainly now about conventional trade and private cyber attack and appoint a civilian director in Fletcher. For the most part a NZ GCSB director Fletcher of a retired General or Air Marshall will have access to little useful targeting or retrieval info. While Fletcher might be keener to discover details and be stupid enough to want to know, his access will obviously less than a US supporting General or Air Marshall. Dotcom is just a bit of expendable collateral offered on a plate. Not really , just wishful thinking on the part of MFAT left and what they have always desired.. The shift of emphasis was just a bit of PR in the final period of the peace dividend. The invulnerable deterrent has always been vulnerable.Sink the missile subs and carriers in simultaneous strike,throw most Soviet heavyweeight strategic missiles to blow away Iowa, Kansas and North Dakota, obliterating the Minuteman firing areas and bring down the B-52 and F-111 over East Germany or Sweden- never impossible The UK/USN SSBN has always been an intergrated operation . Wilson and Healey in 1964 rejected the JFK/MacMillan deal giving Britain an independent key and the RN Vanguards are just an extra US Ohio in the system. After Cuba in 1962 the Sea launched response would never be fast and the Ohios and the RN V class have to rise near the surface, with antenna's up. The submarine is effectively stopped when it fires after 4 key clearance one communicated from the USA. Contrary to what has believed SSN/SSBNs are in continuous communication and in the old days the message went thru in triplcate. Communications breaks are the prime means of interception, followed by eelctronic emmissions, fixed and passive sonars- but ofte n the only chance is the Mk one eyeball if an antenna or periscope is seen above surface at choke points. The Walker spy ring and the raid on the Pueblo resulted in the GRU building continuous replicas of the US communication system running oontinuously with real time fix on US sub locations. NAT0 sonar arrays localised to 100km and sometimes electronic intercepts from one time pads to within 1000km. From pretty early in the missile age a lot of the US SSBNs were essentially MIRV tactical warheads to hit city or military in counterforce and countervalue strategies. As early as Poseidon C3 the only version built each missile carried 10/14 30-40 kilton heads 2/3 times Nagasaki but not thermonuclear MAD at all but nuclear and conventional warfighting weapons. Missile strikes by conventional clubs on CVN or half a dozen cruiser sized 10.000 ton cruisers or destroyer of 3/4 T42 /Daring Astor a/a power could only be stopped by such a tactical MIRV missile and continue what resides by the reinforced deep mountain sub and ship pens in South China, it is definite relevant . Trouble with the secret service is it's secret. And therefore the PM is right to lie if need be to keep it that way. Ms Clark did the same job well, and may or may not have lied about it. I could not possibly comment. It's our enemies' secret services we should be investigating. Campbell lost me years back with his plum in the mouth holier than thou posturing. He should be investigated as a Labour plant like that Maori twit who just got the boot. I disagree Chris, this song won't be over until well after the fat guy gets to sing. I suspect Campbell will have more to report yet. All of this is on record, you just have to keep up with the play...why then, is John Key 'playing ignorant' of the facts, if as you say, it's all on record, open, transparent and clear for all to see? No it's not, Chris. There's a consistent pattern of dissembling and obfuscation from Key and others involved at the high levels. Why would that be, if as you claim, it's all there for us to see? It's a tissue, Chris, an orchestrated tissue. Fact, Fletcher has a background in intellectual property and trade negotiations, not cyber-security. There is obviously a shift to corporate espionage and protection of trade interests. The question needs to be asked whether there has been a shift in priorities. Fact, John Key lied about his relationship with Fletcher and the manner of his appointment, he needs to explain why. Fact, over eighty New Zealand citizens were spied on illegally and yet we have know knowledge of what the justifications were originally. Fact, a New Zealand citizen was executed by a drone and Key is unable to say whether data we have contributed to the Five Eyes alliance has lead to the deaths of other New Zealanders. What are the terms of engagement in this alliance and should be complicit in drone executions. The cyber-security stuff is a smoke screen, I'm sure there is an element of that in their role but I bet it is a minor aspect. We should know what the core functions and priorities are for the GCSB. I never mentioned Clapper in my comment you are just creating a diversion from the fact you got it wrong in this instance. John Key shouldn't be immune from the questions above, he is a servant of the people and he should provide the answers, unless we are mere puppets of the US and he genuinely has no knowledge of what really goes on. I assume you have read Hager's 'Other People's Wars'. In some senses, the frequent common sense view that NZ doesn't really have intelligence services, is correct for the obvious reasons that the budget and pool of talent to staff them is too small and that almost all NZ politicians with the obvious exception of Muldoon and Clark do not want to know much in this area,and essentially want even more than plausible deniability, they simply don't want to know at all. And unless you are 'family' or some sort of expert or highly obsessed or political, common sense is to avoid the area. The reason why Key would have wanted his old friend or associate in such a politically sensitive role is obvious, in that its better PR to have a non military appointment in a country that is not much interested in war or international politics, and Key has closer control of the political handling of any political issue or third rail incident from the political closure point of view. However the appointment of a non military and intelligence figure such as Fletcher means that Key actually is likely to less access to the real targeting and data info than thru someome like Air Marshall Fergusson or any recently retired General who the USA or intelligence authorites are likely tell rather more, knowing than former Anzus era trained officers will be fairly reliable in filtering and inflecting the info and interpretation retailed to Key. Generally speaking most of the analysis on NZ topics has been handled by the Canadians since WW2 including much of the on the ground human intelligence work in NZ. Ottawa is of course one of the main Soviet and Russian intelligence targets and their is clear evidence it remains so. That fact and the devastating effects of the betrayal of the Walker brother spy ring which led to the interception of NATO and Anzus naval communications on a far more comprehensive basis than imagined or really publically much conceded. At the most basic , US communications with its nuclear submarines and even RNZN communications were being intercepted and processed rapidly. Presume NZ's secrets are well known in Moscow and note the latest Canadian double agent is known to have passed on plenty of Kiwi files. The claim that our GCSB bases now are civilian and concentrate mainly on cyber and trade issue was never what it seemed. At the most basic,if your invading Crimea or Georgia- the shut down of the targets computers and electronic warfare capabilities in number one priority and since the 1980s gaining military tech, computer and sonar, sub and communications tech from the west has mean the main Russian/ Chinese interest. In the view of the Clapper vist it was probably mainly to wave some stick and MFAT and the Cabinet for drifting further into the Chinese orbit. Dotcom would have been offered as expendable colateratl to buy the Key/Grosser govt for its doubtful trade led foreign policy in a period of max western disarmament with a liberal left Obama govt in power in the US. In introducing Max Hasting at last years Auckland Readers and Writers - session with Hasting and Slyvia Nasser, Sean Plunkett commented that a few weeks earlier in a private visit to Wellington in 2013 a number of highest US military and intelligence officials had expressed in very strong terms to NZ intelligence, defence and cabinet members that they dismayed concerned about NZ inexplicable drift out of the advanced West and it apparent unbelievable desire not to want to be part of the advanced west. I think you'll find, bsprout, that Fletcher's background extends a little further than those two fields. Check out his stint at the UK Cabinet Secretary's Office, for example. Nor is it "fact" that 85 NZers were spied upon illegally by the GCSB. The Kitteridge Report merely raised the possibility that this had happened and the Inspector General of Intelligence, following his investigation, ruled that only Dotcom had been illegally spied on. The Fletcher John Key knew well was Ian Fletcher's brother. Your grasp of the "facts" being so obviously shaky, my point about journalism involving more than the voicing of shrill opinions, stands. Chris, Key's phone call suggesting Fletcher apply and his meetings before his appointment indicate a relationship well beyond what Key claimed. It is the difference between the actual events and Key's claims that I was questioning. The most telling response to this was the Civilian post of "John Campbell shocks nation by reading politicians’ Wednesday schedules to eerie music". Brutal and simple satire with an effective critique of circumstantial evidence that should perhaps have been read out by a Vincent Price impersonator. Mind you "John Banks asked mud to be thrown in two separate amounts" made me laugh out loud - also direct and relevant. On a serious note - there was no real speculation left to the audience - there was avoidance of stating the conclusions they wanted the audience to make I would guess for liability reasons. I would have taken it seriously if he had addressed the real concern that it's pretty clear the level of electronic surveillance is probably high and certainly murky with what appears to be a bit of a shell game played by the 5 eyes whereby one might not strictly speaking spy on one's own populace but your mates do quite legally and can tell you all about it. Looks like it was a great idea to spy on that Kim fella, now we read some of the evidence gathered. Guilty. Chuck him out. (His wife can stay). Meanwhile China hacked NIWA supercomputer, so proving Key's point about what we need spies for these days. Key govt will be at 55% soon and well deserved so perhaps Cunliff should resign & Campbell should join Labour where his opinions place him. Chris is right, he has departed from being a journalist so should put himself up for office. Or is he a Green? Daft enough. I thought this was a really good article. Thank you. :Why has there been a shift from military leadership to leadership with a commercial background?" Manegerialism probably, with a touch of cronyism as usual.